Ray Chrzanowski began coaching in Derby Little League in 1984 when his oldest son turned 12, and continued through 1991. During his tenure, Ray coached two teams some seasons – one Minor League team and one Major League team – at the same time until 1991. Ray returned for one year in 1994 to coach his nephew, George French – current Derby High School football coach – with his brother in law, George French. Ray came out of retirement for a second time to assist with coaching his youngest nephew in 1996 and 1997. Ray coached 10 championship teams in his 12 years of coaching in our program, and contributed in the building of the Derby Little League field house, as well as the scoreboard that stands in center field today. Ray has set the bar for future generations of coaches, and a large number of his former players have joined the coaching ranks today. 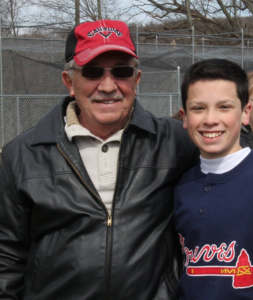 Ray is pictured here with current Derby Little League 12-year-old Bryce Cotter, who caught the traditional first pitch of the 2016 Little League season, thrown by Ray Chrzanowski. Thank you to Ray Chrzanowski for his selfless devotion to the baseball players of Derby Little League.